When the Brake Wear Service indicator illuminates, one of the two Brake Wear Warning Sensors has been triggered. The brake wear sensor is a wire loop that gets worn down against the rotor. Once the wire is worn thru and the circuit is opened, the brake wear indicator is illuminated. 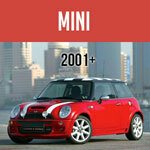 The MINI has a brake wear sensor in the front left wheel, and the right rear wheel. B. The warning indicator should go out! H. Display will then show VIN / Menu, - continue to hold through this until the time Reappears on the display. L. To Reset the warning indicator alarm - Press & Hold the BC Button at the relevant symbol until RESET appears - then press and hold again until the process is complete. M. Turn Off and On the Ignition again - Warning should now have gone! A. Sit in car, close door and turn ignition on. B. Press and hold trip reset button for 10 seconds. C. The upper display in the tach will be illuminated with a service warning item. the lower display in the tach will indicate the remaining time or mileage left for that service item. Pressing the BC (board computer) button repeatedly on the end of the turn signal stalk will allow the display to scroll through all of the condition based service items. D. To reset, press and hold the bc button again and the lower screen will indicate reset. E. Pressing the bc button only resets the item displayed in the upper window only. Repeat the procedure for any additional service reset needs. Even if you don't 'feel' the parking brake drag while driving, you should check it with the car lifted off the ground. The rear wheels should turn freely - if there is any drag, the parking brake may require further adjustment. If the wheel turns freely, then there may be a sensor that is defective. Just used the information above for my daughter's 2005 Cooper S. 30 seconds seems like a lot longer as you sit and wait, but the job has been done successfully and I wanted to say thank you. Want to add it worked the first try, though I worried about screwing up the timing and order. 2007 S Hatch. Going for inspection soon. Still like to eliminate the unwarranted faulty lamp indicator. Any tips on that anybody? Yay, I reset it. Now, how do I stop the faulty symbol from making intermittent appearances all is working perfectly. Dealer wants $160. Interestingly the usually good Haynes workshop manual makes no mention of having to reset litgh certainly doesn't say how to do it. Did not work on my 2006 mini cooper hatchback. Tried several times. 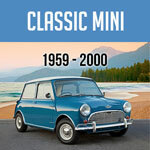 meam1966, what is the year/model of your MINI? Edit: I added another set of procedures to the article above that you can try. I had my front and rear brake pads replaced, and have replaced both front and back sensors. I have tried this procedure 5 or 6 times with it saying it was Resetted - but my the warning still on. Any suggestions as to why I can't get it to go out? Worked first time for me! Had new front pads and discs fitted incl sensor (Mini cooper 09). Great thanks. Worked a treat on our 2011 One Convertible. Replaced discs & pads all round and saved nearly £400 from dealer quote. Thanks! It worked on the 3rd try on my 2009 mini cooper. Couldn't get that pesky thing to go out after new brakes and sensors front and back. God bless the internet. Worked for me on the 4th attempt, I have a 2008 Cooper Diesel. Thank you so much. Just had rear brake pads replaced on my 2008 Mini Sidewalk convertible and the warning won't go off, when I replaced the brakes in front and reset the computer it worked ok but not this time with the rear brakes, do we need to replace the sensors? Minimania: If the brake pad warning was lit, and the reset procedure did not work, then yes, you need to replace the sensor. Worked first time for 2009 Cooper. Thanks! Right rear sensor was open circuit. Replaced sensor and reset per above instructions. Took a few tries to get it right. The symbol reset. Procedure worked on 2012. Thanks for the procedure. It worked the first time on my 2010 S hatchback. Worked in my 2010. Thanks for the info! It is a little touchy as there are many steps and the light will not stay on for very long so you cannot read and do it at the same time. Took me 3 times but I got it off! Rodders shut the drivers door whilst resetting, this causes the exclamation light to extinguish and allows you to reset as described. Worked for me. Had to try it a few times. Timing seems to be critical. Worked for me - Thank you. Had to try 3 times but reset ok in the end.